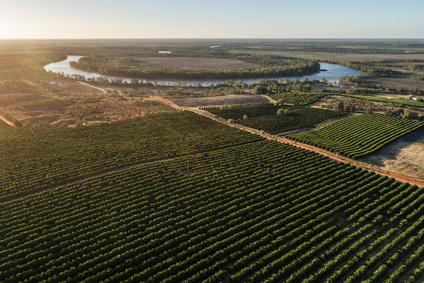 Citrus farms along the Murray River in South Australia. 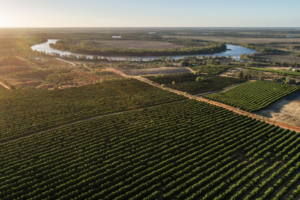 The aim of our research was to quantify the impact of historic land-use (LU) and hydroclimatic variability on landscape connectivity dynamics in surface water networks across Australia’s breadbasket, the Murray-Darling Basin (MDB). The MDB is a major dryland region with scarce and highly variable water habitats that are subject to competing demands, major droughts, and LU change. We found that LU was important in determining landscape connectivity at local scale, whereas hydroclimatic variability dominated landscape connectivity at the basin scale. Areas where LU played an important role in decreasing landscape connectivity coincided with areas where LU changed from production from natural environments in 1992 to production from dryland agriculture in 2010. These areas were located along the eastern edge of the MDB. In some areas, landscape connectivity reductions were driven by a change in LU from irrigated agriculture to dryland agriculture. What are the implications of your findings and why is landscape connectivity an important ecological service? Our findings are important because land-use change can be managed more effectively compared to climate-mitigation actions, which may be intractable. Therefore, being able to pinpoint areas where land-use plays an important role in determining landscape connectivity helps with prioritizing areas for management intervention. Why is landscape connectivity an important ecological service? The current rate of species extinction is considered so extensive that it is commonly referred to as the Earth’s “sixth mass extinction”. This has serious ecological, economic and social consequences as it impairs essential ecosystem services ranging from crop pollination to maintaining a livable climate. The greatest threats that accelerate species extinction are habitat loss and fragmentation. To combat species loss and extinction, maintaining and enhancing landscape ‘connectivity’- the degree to which the landscape facilitates or impedes movement of animals, has been widely advocated as a key conservation tool. With limited resources, however, deciding how and which areas to prioritize for connectivity conservation is not a trivial task, particularly in dynamic systems such as surface water habitats in dryland environments that show very high natural hydroclimatic variability, with habitats shrinking, splitting into multiple smaller ones or drying up and refilling or merging into larger ones during wet conditions. To improve habitat prioritization, current advances in landscape connectivity have integrated time-series of potential habitats derived from the Landsat archive to model how spatial connectivity of habitat networks changes over time and across space (e.g., Tulbure et al 2014, Bishop-Taylor et al., 2017a, b). Despite the fact that changes in LU can strongly influence dispersal potential over time, in our prior research we primarily focused on the impacts of changes in the distribution of potential habitats, without incorporating changes in resistance to movement due to changes in LU. In this research we used 8 time-steps of historical land use (Australian Department of Agriculture and Water Resources) together with a time series of surface water habitat dynamics derived from seasonally continuous Landsat time series (1986-2011, Tulbure et al. 2016) over the MDB, to quantify the synergistic impact of LU and hydroclimatic variability on landscape connectivity. We used the seasonally continuous time-series of surface water maps derived from the Landsat archive (Tulbure et al. 2016) to model dynamics in potential surface water habitats and quantify changes in habitat network structure and the distribution of important areas for connectivity (i.e. hubs and stepping-stones) over seasons, years and almost 3 decades. Landsat is currently the only archive of remote sensing data that can provide a consistent historical record going back to the 1980s. The period investigated in our research encompassed both the most severe drought (the Millennium Drought, 1999-2009) and most severe flooding on record (the 2010-11 La Nina years) for the MDB, thus providing an unprecedented opportunity to quantify spatiotemporal dynamics in surface water habitat connectivity dynamics across a spectrum from dry to wet. Potential habitat graph theory networks for the SE of the Murray-Darling Basin, along the Murray River. Graph nodes (grey) represent potential inundated habitat area (Landsat-mapped) connected via graph edges (blue lines) for long-distance dispersal amphibians using resistance-distance based on the 1992 land-use layer (top-left) and the 2010 land-use layer (top-right). 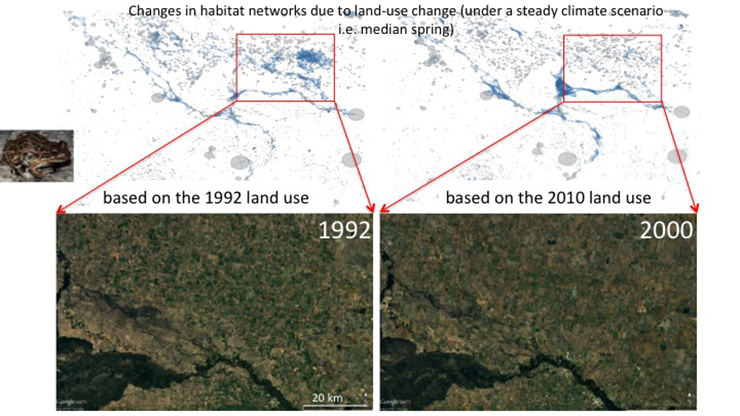 Red boxes highlight changes in network structure for an area where the land-use changed from production from irrigated agriculture to production from dryland agriculture (as seen in Landsat images below). Image credit: Tulbure et al. Bishop-Taylor, R., M.G. Tulbure, M. Broich. (2017). Impact of hydroclimatic variability on regional-scale landscape connectivity across a dynamic dryland region. Ecological Indicators. Bishop-Taylor, R., M.G. Tulbure, M. Broich. (2017). Surface water dynamics and land use influence landscape connectivity across a major dryland region. Ecological Applications. Tulbure and team processed and analyzed data on the ‘Raijin’ high performance cluster part of the Australian National Computing Infrastructure (NCI), which is supported by the Australian Government and Intersect Australia Limited’s ‘Space’ high performance storage infrastructure. Drs. Wei Fang and Joachim Mai enabled the computationally and data-intense components of this work.